We recommend each customer apply Scotchgard ™ or a similar carpet protector product after a professional carpet cleaning in Denver. It’s a smart idea to keep your carpets looking their best. There are a number of different carpet protector products available to protect your carpets and upholstery. The most well-known of these is Scotchgard ™. Why use a Carpet Protector? Most carpets these days come from the factory with some kind of protective coating. 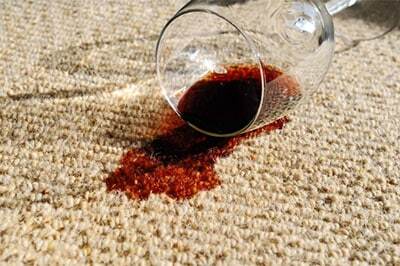 You probably have noticed that new carpets are more resistant to spills, stains and soiling than those with a few years on them. Over time, factory applied carpet protection fades away. When this happens, this protective coating needs to be restored. In addition to the benefits of added soil and stain resistance, you will also experience faster and easier dry soil removal with your vacuum. The result is that your carpets will stay looking better, longer. Different carpet protector manufacturers claim different methods of action. Scotchgard ™ claims to “force liquids to the surface where they bead up for easy cleanup”. Effectively, it surrounds carpets and upholstery fibers with an invisible barrier to protect against oil and water based stains. This allows for more time to clean up the spill before it penetrates the fiber and causes a stain. Meanwhile, products like Maxim Advanced claim to “coat the fibers with a stain barrier to protect them from difficult dye stains ‘from the inside out’.” Both products are considered environmentally friendly. Which Carpet Protector Do We Recommend? We apply either Scotchgard ™ and Maxim Advanced ™ products depending on a customer’s preference or brand loyalty. In general, we prefer the Maxim Advanced product, but we’re happy to apply Scotchgard ™ instead if you like. We have had positive experiences with the Maxim Advanced solution. It also both Shaw Approved and also meets Wool Balance standards. Either product can be applied to nylon carpets or to wool carpets. How Do We Professionally Apply Carpet Protector? The best time to apply carpet protector is after the carpet or upholstery has been professionally cleaned. We use a power sprayer to apply the solution to the surface carefully and evenly. Of course, we are careful to ensure we cover all areas. For carpet, we then use a carpet grooming rake to work the solution into the fibers to ensure even and deep coverage. Can Carpet Protector Products Provide Upholstery Protection too? They absolutely can! Upholstery protectors work great and will mitigate damage caused by spots or spills. They also allow for easier cleaning and maintenance. 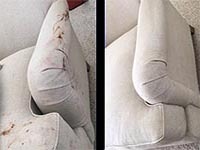 This means your upholstery will stay looking its best and not dirty or worn. After a professional upholstery cleaning, we apply different products, still from Scotchgard™ or Maxim™ than we use for carpet. The reason for this is that upholstery need to stretch and flex, while carpet does not. Specific solutions, therefore, need to be used to make sure they are flexible and won’t come off prematurely. 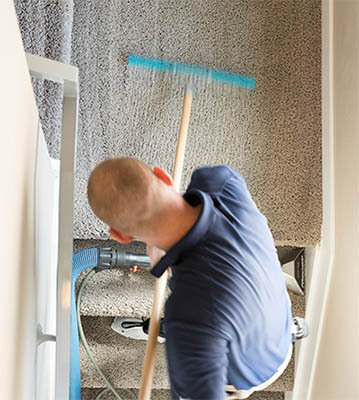 Applying carpet or upholstery protectors after cleaning carpet in Denver or nearby areas is a great idea. It will keep your carpets and upholstery looking better, longer. It will also help avoid the panic immediately after a spill occurs. 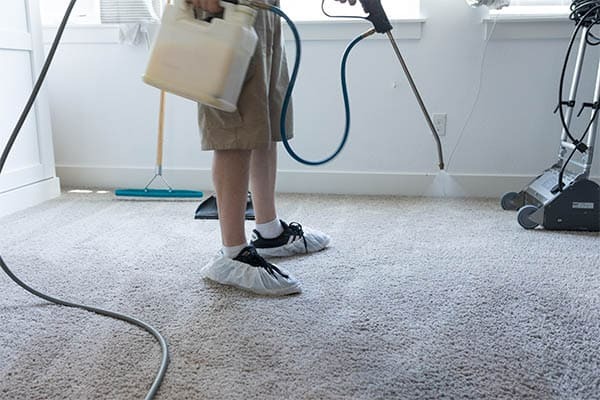 You’ll both have more time to clean it up and you’ll know that anything remaining from the spill can be more easily cleaned the next time we clean your carpets or upholstery.